Are you patriotic? 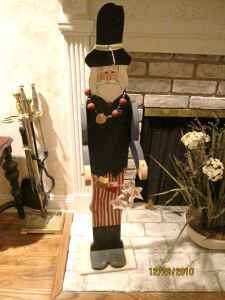 Do you love Uncle Sam? I saw your ad on Craigslist for the "Are you patriotic? Do you love Uncle Sam?" . I am very interested in the cardboard homeless guy you are selling but I am a little concerned. In the ad you say, "If you're patriotic, this is a must". Since you are selling it I guess that means that you are no longer patriotic. What happened? Have you been brain washed by evil doers, or is it our new the socialist government? No, I am still patriotic, though I agree with you about our “new socialist government”. I guess it was a poor choice of words, saying it’s a must to have. I will change that. We are downsizing and need to get rid of stuff. If you’re interested, that’s great. It is wood, though, not cardboard. Since you haven't replied I guess that means I convinced you to keep it? Too bad cause I really wanted it. Yes, it is still on the market is posted on Craigslist. I agree with everything you have said (on the political front), but, as you pointed it, it is preaching to the choir. I am so sick of this government and of what is going on, that I don’t even want to think about it anymore. Word. One last thing... why is this little guy a symbol of patriotism? years ago or so (he used to be holding a flag but it fell off - maybe that’s very fitting! It happened after Obama won the White House!! heehee). Anyhoo, I don't know who your uncle is, but my cousin Troy is super patriotic too. He flew to Alaska just to live closer to Sarah Palin. I should make a wooden statue of him and then we can just trade. What do you think? I love Sarah Palin, but she’ll never win the White House. Too many people in this country that depend on hand-outs and entitlements. Ya, why should the winners be paying for the losers. Everyone starts with the same chance to be successful and some people are just lazy and hang around living like kings on welfare. Maybe if they spent a little more time working and a little less time collecting handouts and partying on their yachts we could elect someone like Palin, who is obviously qualified to be the leader of the US. Anyway, should I send you a picture of Troy? Sarah's awesome 'cause everybody hates her.